Two Israeli medical device concepts for easier diagnosis of pneumonia win Grand Challenges grants. This severe infection in the lungs causes more deaths in kids under five years old than AIDS, malaria and measles combined. Treatment is simple and effective, but in developing countries the problem is diagnosing it in the first place. Two Israeli startups with promising products to meet the acute need for diagnosing pneumonia recently won seed grants from Grand Challenges Israel, a program launched last year by MASHAV-Israel’s Agency for International Development Cooperation with the Office of the Chief Scientist at the Israeli Ministry of Economy and the Israeli Prime Minister’s Office. “In Israel, there is a large community of developers and entrepreneurs whose innovations are focused primarily on Western European and North American markets,” said Israeli Chief Scientist Avi Hasson at the grant award ceremony on January 18. Other grantees in the healthcare space are Everywhere Diagnostics for its mobile cervical-cancer screening device; Biogal-Galed Labs for its detection test kit for Leptospirosis; and Westham for its new approach toward malaria. The winning startups with a focus on pneumonia diagnosis are RespiDX and NanoVation-GS. Both address the reality that the usual methods of diagnosing pneumonia in the developed world don’t work well in developing countries. X-rays aren’t widely available; and though pneumonia causes faster respiration, counting breaths per minute isn’t possible in noisy clinic environments. Nor are community health volunteers adequately equipped to make an accurate diagnosis from respiratory monitoring. RespiDX has designed the Respimometer, which looks like a cross between a pacifier and a digital oral thermometer. The mouth stop just under the child’s nose would be embedded with sensors to measure breathing. 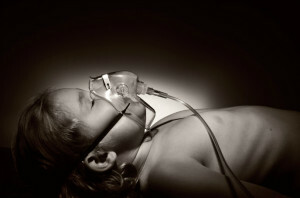 “We filed a patent and now we’re looking to use the grant to make a prototype and test it against existing means of measuring respiration rate to prove it’s good enough to be out in the market,” says Ian Solomon, a serial medical-device entrepreneur who is part of a group that founded RespiDX a couple of years ago with the encouragement of pediatric pulmonologist Dr. Israel Amirav of the University of Alberta in Canada. RespiDX has applied for a Bill & Melinda Gates Foundation grant and is also seeking matching funds to run a test project in Africa in order to identify cultural and field conditions that could impact the final design of the reusable product and the training protocol for healthcare workers. Grand Challenges Canada is interested in collaborating with RespiDX to help move the product development forward, says Solomon. Future models could be enhanced with additional sensors to provide a home diagnosis product for people in developed countries. This company in Haifa is developing a stick-on patch coated with a thin film of nanomaterial containing a sensor to measure respiration. “You just put it on the child’s face and it ‘feels’ when it’s in contact with the skin and starts to measure respiration rate autonomously,” says cofounder Sagi Gliksman. “We did feasibility checks on children and adults, and we saw good results in detecting breath rates,” he tells ISRAEL21c. According to the World Health Organization (WHO), 50 breaths or more per minute indicates pneumonia in infants, while 40 or more breaths per minute signals pneumonia in children aged one to five years. “Our Grand Challenges grant will allow us to develop an electronic data acquisition system to log the data from the sensors, and to design the patch so it’s comfortable and attractive enough that parents will feel comfortable using it for their children,” says Gliksman. NanoVation-GS was established in March 2014, but the groundwork started a year and a half earlier, when Gliksman and cofounder Gregory Shuster were graduate students in the laboratory of Prof. Hossam Haick at the Technion-Israel Institute of Technology. Haick is best known for his Na-Nose nanosensor device to detect diseases through breath analysis. They envision the patch as a screening tool for community health workers who go from village to village in Africa checking sick children’s respiration rate with a stopwatch. Gliksman said statistics show these crude evaluations to be highly inaccurate in detecting pneumonia. With Haick advising them, the duo has been taking an important role in a new consortium grant from the European Commission’s Horizon 2020 program, and Grand Challenges Canada also is interested in this project. “We hope to develop our patch to have more components, such as a temperature sensor, for hospital use with preterm infants. We are now submitting an application to the Office of the Chief Scientist for a grant to fund that,” says Gliksman.